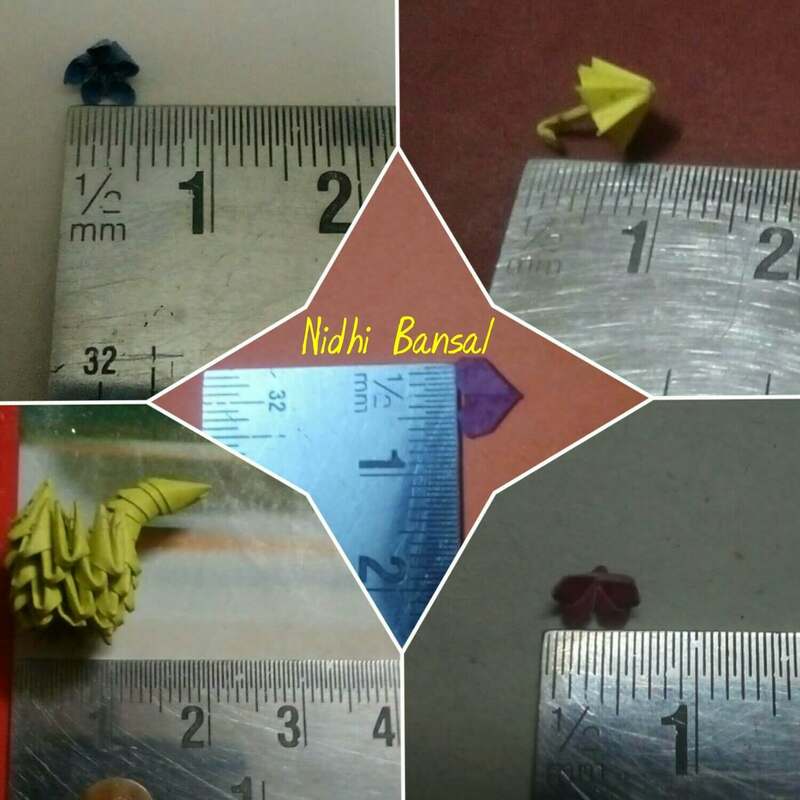 You must have seen many successful people in different fields but what Nidhi Bansal excels in is almost beyond your imagination. Her story is filled with uniqueness and inspiration. She holds the record of having the biggest sticker collection in the world. She got her name registered in the Guinness Book of World Records in the year 2013 with 102,317 stickers. With more than one lakh stickers in her collection, she has made India proud worldwide. Nidhi was born in Punjab on 6th June 1989, and the idea of collecting stickers was never on the cards when she was a child. It was a normal routine of studying and playing- that she followed. Now, coming from a state where the birth of a daughter was considered bad luck what motivated her to do something big like this? It was a regular evening when she was enjoying television with her family. 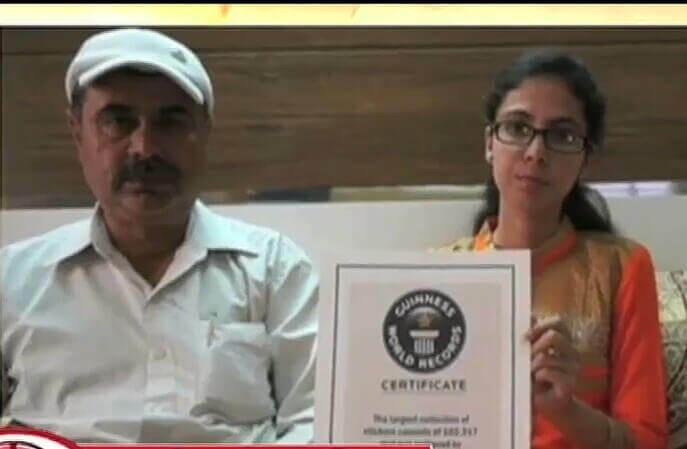 Something struck her father’s mind, and he asked Nidhi if she could somehow get her name in the Guinness Book of World Records and make her country proud. This prompted her to try and do something. Soon after, in 2007, Nidhi started collecting stickers regardless of their size. The total number of stickers according to the Guinness Book of world records stood at around 102000. This number rose to more than 103000 in the India Book Of World Records in August 2015. The most massive sticker she has is of 22 inches. Everyone around the world has appreciated her achievement. She had a dream which not many have, now she has the records which not too many people think of achieving. Apart from the Guinness Book of world records and the India Book of World Records, she also engraved her name in the Limca Book of World Records. 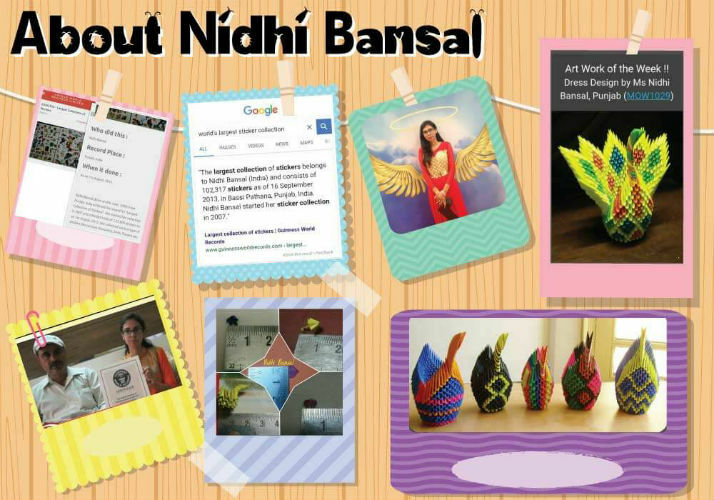 The India Book of World records has recognized her love for art with the 101 Swans Category Paper Art Work in the year 2015. Moving on, she holds the record for the Smallest Paper Swan, Smallest Paper Flower, Smallest Paper Umbrella, Most Stars are drawn in one minute, Smallest Butterfly, and the Smallest Paper Heart, as recognized by the Setter Record. Apart from hard work, this has been made possible by grit and perseverance. After years of struggle, Nidhi was able to create moments of glory later on. After her passion won her accolades from around the globe, Nidhi began a new journey by becoming the founder of Sidhnath Crafts N Creations Society in 2017. She has a passion for spreading art and craft to every part of the country. When every child recognizes the importance of Art and Craft, nobody would be happier than her. Nidhi Bansal is not only an inspiration for every woman out there but also a living example of grit for those who give up on their dreams halfway through. Whatever talent she had, she used it all in the right direction and made a world of her own, a world of records. She has fought the gender stereotypes in her own style and done something which she thought was the best for her. The people who once thrashed her idea of sticker collection have now become her admirers, that’s the power of determination and hard work for you. While doing all this, she has made her country proud. “All that we are is the result of what we have thought. The mind is everything. What we think we become.” – Gautama Buddha. She has also won the Nobel Foundation Award ( Ludhiana ). 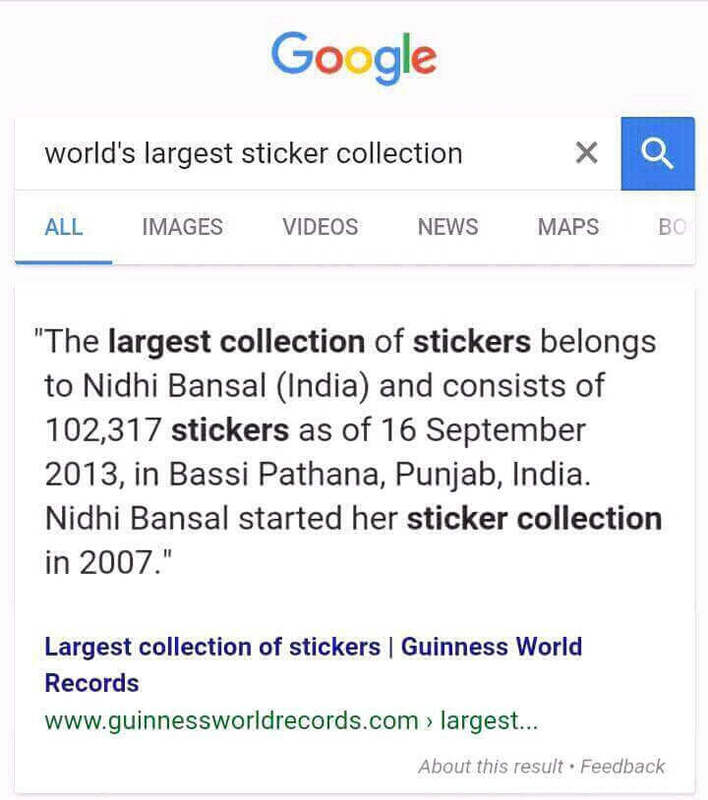 Nidhi holds a Record in the Guinness Book of World Records as the largest sticker collector in the world. She also runs an art and craft society named as Sidhnath Crafts N Creations Society for promoting art and crafts.